Whats better than basketball? Basketball Plus Swimming! 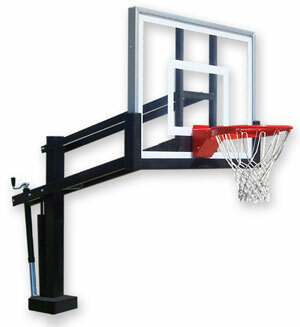 Turn your pool into a basketball court with the HydroShot II by First team! The kids will Love it! HydroShot II Swimming Pool Goals The HydroShot Adjustable Swimming Pool Basketball Hoop brings premium grade basketball performance to your poolside! For those who love to hoop it up while they splash around, First Team introduces the HydroShot STAINLESS STEEL adjustable swimming pool basketball goal system. The HydroShot's 4" square post and dual strut extension arm make a "tough as nails" poolside unit that will NEVER RUST!! No more flimsy, plastic models. The HydroShot Adjustable Swimming Pool Basketball Goal will far exceed your expectations for a poolside basketball unit. The HydroShot Swimming Pool Hoop comes complete with your choice of three clear, professional looking acrylic backboards and breakaway rim. To adjust the unit, simply turn the crank handle positioned for easy access from the pool deck. The unit is infinitely adjustable from regulation 10' down to 6'6". An easy-to-read height indicator is provided as well. Designed for commercial waterparks, the HydroShot Adjustable Basketball Goal also makes a first class residential poolside hoop. First Team's unique anchor bolt installation design allows you to easily relocate the unit if you ever need to. An anchor bolt cover is provided with each unit. For additional safety, backboard padding is available to all model of HydroShot Swimming Pool Basketball Goals. *For additional rust resist rim, specify FT172D-GV galvanized fixed rim. **For flush surface mount when post is removed, specify FT1350-SA surface anchor. Approx. Shipping Weight: 245 lbs.